CITY HALL – Arcata Kineticab proprietor Mark Sailors has had some memorable days over the past year. One was last Oct. 28. That was the day he found out his mother had cancer, and that his wife was pregnant. Another was last Wednesday. Sailors had grabbed a coffee and a paper with news of his City Council candidacy at the Co-op and headed home to read all about it. “I was literally just coming in when the phone rang,” he said. It was someone from City Hall, telling him that after six months running his bike taxi business, there was a whole new set of requirements he had to fulfill to continue to operate. When he started up Arcata Kineticab in February, Sailors checked in with City Hall to find out what he had to do. He worked his way down the checklist running a Fictitious Business Statement, getting a business license and $2 million in liability insurance. 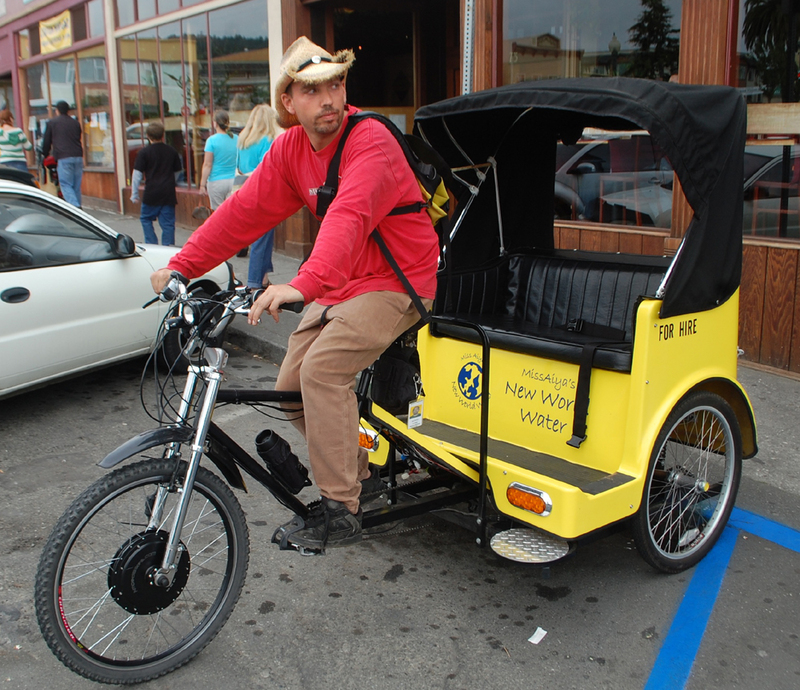 Then he hit the road, hauling passengers around town in his bike taxi. Response was good and demand was brisk – so much so that he hired six part-time drivers. Up until last week, Sailors and Arcata Kineticab were an Arcata-style alternative business success story. Under Title VI, Chapter 2 of the Business, Professions and Trades section of the Arcata Municipal Code, taxicabs accepting passengers are indeed required to get a Vehicle Permit – the manner of propulsion for the vehicle isn’t specified. Further, any drivers have to get a Vehicle for Hire Driver’s Permit. That, says Sailors, will probably put him out of business. He’s a medical cannabis patient due to a back injury, and the required physical will likely pick up the THC in his bloodstream. “I guarantee you I will fail,” he said. His employees are in the same boat – they all quit rather than face the prospect of a drug test. Sailors has sunk all his family’s savings of $20,000 into his new business, and isn’t optimistic about meeting the newly revealed legal requirements. “I can either not medicate and not be able to work, or medicate and not pass the test,” he said. Though local herb stores sell blood-scrubbing tea and purgatives which have helped many pass employment drug tests, Sailors won’t play that game. “It would be illegitimate and fradulent and against everything I stand for,” he said. Finance Director Janet Luzzi, who has served as acting city manager for the last few weeks, said the paperwork snafu was because of the infrequency of taxicab applications and the staff’s unfamiliarity with the requirements. “We don’t do this very often,” she said. Sailors is now operating under an emergency permit, and said he was told that the City is not going to shut him down while his Vehicle for Hire applications are pending. He said he’s gotten mixed messages from the City – that it “wouldn’t make an issue” of his 215 status, but that he won’t get final sign-off if his urine test comes back positive for cannabis use. And even with those approvals, the Vehicle for Hire Permit would ultimately have to be decided by the City Council, two members of which he is running against. If the goal was to stifle his candidacy, as he suspects, it’s already working. He said he wasn’t able to participate in Sunday’s Progressive Picnic at the Mad River Pump Station because he was stuck at home filling out forms. A competing candidate for council, Dave Meserve, was able to participate and speak to attendees. He’s openly contemplating legal action. Despite the slings and arrows and bureaucratic monkeywrenching, Sailors is keeping a positive attitude. “It’s going to work itself out, one way or another,” he said. This entry was posted on Thursday, August 19th, 2010 at 4:51 pm	and is filed under News. You can follow any responses to this entry through the RSS 2.0 feed.